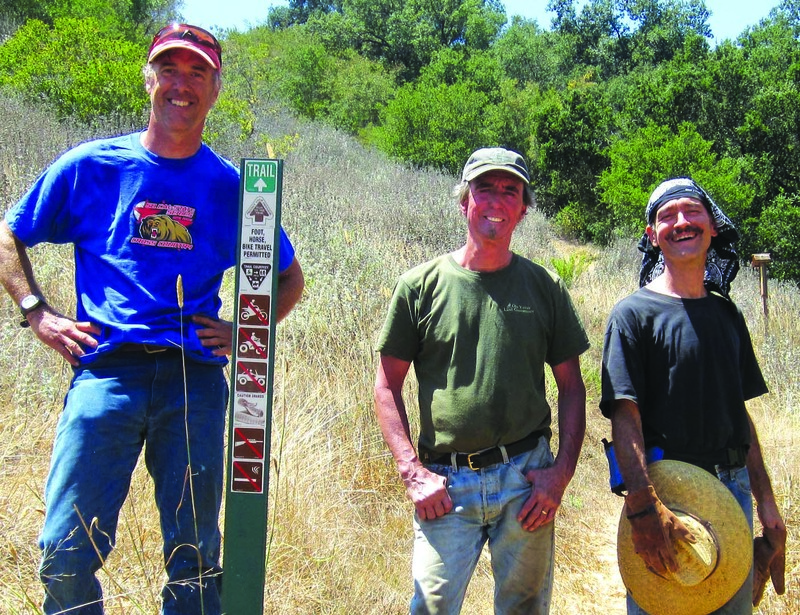 2010 has been the year of the trails for the Ojai Valley Land Conservancy. With the help of many volunteers, generous benefactors and grant funding, we’ve been putting your membership dollars to work on the trails of the Ventura River Preserve, the Ojai Meadows Preserve, Fuelbreak Road and the Ilvento Preserve. These trail extensions and improvements are great examples of how every membership dollar can be multiplied to provide projects that benefit our community. By securing grant funding and working with the help of our dedicated volunteers we can accomplish projects far beyond what we could do on our own. As of this month, over three miles of new trails have been cleared on the Ventura River Preserve, and the new Baldwin Road trailhead will begin construction in November. Funded by a grant from the California River Parkways program, this trailhead will provide trail access to the southern end of the preserve. The Baldwin Road Trailhead will feature an equestrian friendly parking area, interpretive signage and nearly one-half mile of paved trail for wheelchair access. Be sure to watch for an announcement of the grand opening this spring. On the north end of the Ventura River Preserve, a new trail has been cleared extending the reach of the Rice Canyon trail up to the Kennedy Ridge where specatcular views can be seen. Though this trail is now only open on the Ventura River Preserve, it is our hope that by working in partnership with the Forest Service, one day it will pave the way to a connection with Forest Service trails to the north. We’re excited to announce that OVLC has been awarded a new grant which will fund long-needed trail improvements on the Wills Canyon trail. Unlike common grants that provide cash, this grant will come in the form of crew time by the California Conservation Corps (CCC). The OVLC will receive 5 days of crew time that will be put to use repairing two eroding sections of the Wills Canyon Trail. Each crew consists of 12-15 members, so we will have a lot of people power. The grant program is a partnership between the California Council of Land Trusts and the California Conservation Corps, both long-term partners of the OVLC. See details about the project below. In an ongoing partnership between the OVLC and The Thacher School, Preserve Manager Rick Bisaccia met with Thacher faculty Bo and Julie Manson, Brian Pittick and a group of students to work for the second time this year on the Ilvento Preserve trails. In an April talk before the faculty and students of the school, the OVLC Preserve Manager enlisted a core group of student volunteers to work on thetrails several times a year. Out of this has grown a new club called the Thacher Conservancy Club spearheaded by student Chasen Smith of Santa Barbara. The club and the OVLC have had two successful trail work days followed by donuts and orange juice generously provided by the Mansons. The next trail work day is scheduled for Saturday, December 4th from 9:30am -12:30pm. Anyone interested in helping should contact Rick Bisaccia, Preserve Manager at rick@ovlc. Thanks to the generosity of a local family of consummate birders and nature enthusiasts who love spending time on the Ojai Meadows Preserve, visitors will soon enjoy two new viewing benches and a self-guided tour via three new interpretive signs. While taking a stroll on the Ojai Meadows is always a delight, now there will be two places to sit among nature’s wonders and enjoy the many sights and sounds of wildlife. In addition to the new kiosk sign that was recently installed, three new interpretive signs will help inform visitors about the Ojai Meadows wetlands restoration project, how the wetlands of the Meadow impacts our watershed, and what wildlife has returned since the restoration project began in 2007. The CCC project in Wills Canyon will repair two gullies that have formed along the banks of Wills Creek. Drainage off the trail, combined with water flowing in the creek have created gullies that threaten to wash out the Wills Canyon Trail. OVLC’s solution is to modify the drainage on the trail to prevent erosion, and to stabilize the lower stream banks to keep excess sediment from entering Wills Creek. 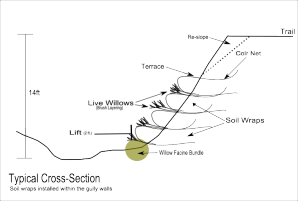 The stream bank repair will be done using live willows and coconut fiber netting in a design called a “soil wrap”. 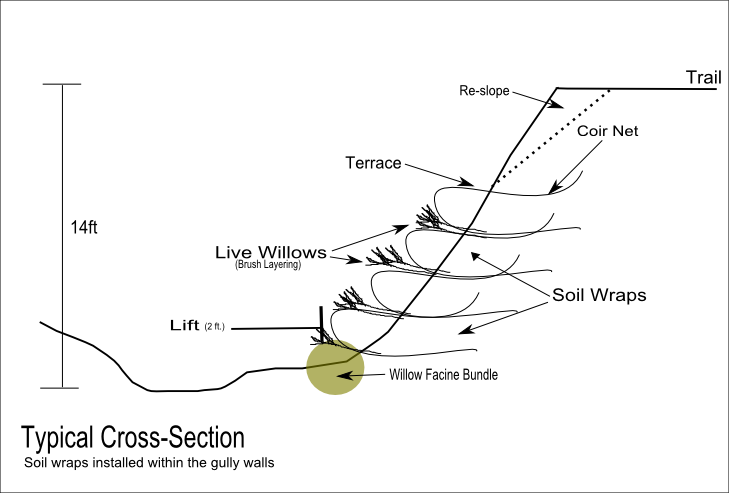 A soil wrap is built by wrapping soil in erosion control netting in the shape of a taco with the closed end facing the creek. (see illustration) These wraps are stacked on top of each other in a terraced pattern to create a natural bank slope. Between each wrap live willow branches are layered which will ultimately root into the bank and result in a naturally stabilized bank. The netting holds the soil until the willows grow, then biodegrades in a few years. Methods that use natural materials to create structural protection of stream banks are called “bioengineered” structures. Experienced OVLC staff will use thisopportunity to train CCC crews on how to build soil wraps so this natural approach to stream bank repair can be used on other sites throughout the region. The young men and women of the CCC work throughout the state on projects to improve the environment and respond in emergencies such as fires and floods to help protect the public. With a motto that reads “Hard work, low pay, miserable conditions… and more!”, we know they’re up for the challenge. The California Council of Land Trusts represents 150 small land trusts throughout California providing legislation tracking, support and training opportunities for local land trusts. We are grateful for the support of our partners, they make great things possible. DEEPLY APPRECIATE YOUR NOTIFICATION WHEN THE (SPRING) OPENING OF “OLD BALDWIN ROAD TRAILHEAD” WILL BE OPEN TO THE PUBLIC SO I CAN TAKE MY 89 YR. YOUNG DAD! THANKS FOR ALL YOUR HARD WORK!